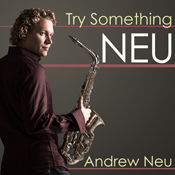 Try Something Neu (nuGroove Records) is packed with a colossal group of stellar all-stars that includes Bobby Caldwell, Brian Bromberg, Chuck Loeb, Brian Culbertson and Gerald Veasley. The respect toward Andrew by his peers is evident in the musical conversations you hear in each track of Try Something Neu. “The sheer amount of stellar guest-stars packed into this CD shows you just how much this young talent is already respected in the industry. The future is very bright for Andrew Neu,” said David Chackler, President/CEO of nuGroove Records.